When you look out over the healthcare landscape the last few years, you see nothing but uncharted territory. That goes for science and payment systems. Let’s start with very different change on the far horizon. We’ll kick off this week’s health wonkery with David Williams of The Health Business Group in Boston who writes about a new kind of selfie in Ready for the EyeSelfie that has tremendous implications for just about everything – from the role of doctors to the locus of care to privacy to payment. David reports a story in The Boston Globe about research over at MIT where innovation meets science fiction. While eye selfies might be a few years away, other transformational scientific discoveries are allowing docs to tailor treatment based on your genetics today. That is the real end game of personalized medicine as explained by Jason Shafrin at Healthcare Economist. Read about it in Personalized Medicine is the Future. The excitement of paradigm-smashing discoveries is attracting investment into research. Ann Bonham, Chief Scientific Officer at the Association of American Medical Colleges writes at Wing of Zock about the 21st Century Cures Act, and the role of public-private investment in bringing bench science to patients. Check out Investing in Medical Research: Intensive, Long-Term and Worth It. All this innovation will come at a cost. To whom? We’ve been sorting that out for nearly a century when the cost of healthcare exceeded the average family budget sometime after the local doc stopped taking a basket of eggs (there it is!) as payment for services rendered for delivering the farmer’s baby. Which leads us to Obamacare, single payer and other insurance permutations. While some things change, Obamacare is here to stay, predicts Joe Paduda at Managed Care Matters. When the ridiculously large field of GOP presidential contenders gathered to discuss the important issues of the day, Where was Obamacare, asks Joe. The landmark healthcare legislation’s failure to get much attention from the blustery, bloviating group is proof on its face that the matter is settled, he suggests. Even if Obamacare is the law of the land, the states are still looking for a better way to pay. Louise Norris at Colorado Health Insurance Insider says universal healthcare coverage could be a reality in Colorado a few years from now, although it admittedly has some significant hurdles to overcome in the meantime. Supporters need to gather 99,000 signatures in order to get the ColordoCare initiative on the 2016 ballot. And then voters would need to approve the measure to get the ball rolling. If both those things happen, Colorado could have a universal healthcare system in place by the start of 2019. Iowa is one of 50 states struggling to figure out how to pay for Medicaid obligations, and has decided to join those who are giving their problems to private managed care organizations. University of Iowa’s Brad Wright at Wright on Health was interviewed by NPR on this important issue and he links to the audio in this week’s blog Medicaid Managed Care in Iowa. It is not only Medicaid that is seriously under water. Guest blogger Wendell Potter at MedicareResources.org says that a poorly constructed Medicare pharmaceutical benefit is lining the pockets of BigPharma and the insurance companies while the senior health insurance program is seriously underfunded. Oh, and Wendell points out that corporations will continue to call the shots as long as they have lobbying access to lawmakers. Meanwhile, Americans pay a disproportionate share for drugs to keep the game going. Read the detail in Paying Through The Nose For Prescription Drugs. While drugs are a part of the high cost of healthcare, when you look at who consumes a large proportion of healthcare resources, it is the superusers who are costing the big bucks, as explained by Brad Flansbaum this week in The Hospital Leader. Brad discusses a new Health Affairs study that digs into the profile of the superuser to find that while a constant percentage of people are superusers, the individuals who comprise that group are not constant, and what that means for managing high-cost patients. Details are here in Misjudge the Outlier Patient at Your Peril. Not all rejected claims are bogus or go unpaid. In fact, most rejected claims have a legitimate and often correctable problem, says insurance executive Mike Feehan who is blogging at Hank Stern’s InsureBlog.com this week. Mike debunks the notion that insurance companies routinely (and fraudulently) deny perfectly legitimate claims, and explains the simple steps necessary to avoid delays. Read about it at Urban Legends, Insurance File No. XXIV. If you really want to attack healthcare costs at the source, you can’t ignore the influence of the tobacco lobby on business, says Roy Poses of Health Care Renewal. In this week’s post, Roy traces the connections of some of the most influential members of the American business community – the board of the U.S. Chamber of Commerce – and how the U.S. business group impacts global antismoking policy. If you never fail to be amazed, read With 10 Healthcare Executives on Board, U.S. Chamber Defends Big Tobacco Abroad. Finally, corporate responsibility is also on the mind of Julie Ferguson in her post this week, Fall from Grace: Dupont in OSHA’s Severe Violator Program. Once the poster child for model occupational health and safety programs, things are very different at Dupont today. At Workers Comp Insider, Julie posts about the many failings that led up to the deadly chemical leak at the LaPorte, TX facility last November and OSHA’s subsequent actions. While workers paid the price in this incident, shoddy safety handling highly lethal chemicals poses a frightening public risk, too. With that, we’ll end The More Things Change edition of Health Wonk Review. 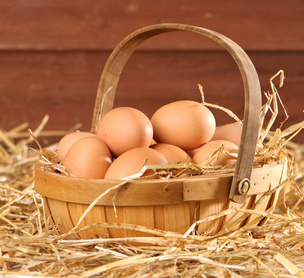 The moral of the story: You can’t pay for 21st Century medical advances with a dozen eggs. Thanks so much for hosting, and for including our post.